2003 WIBF European Champion (Boxing) and 2004 Swedish Kickboxing K-1 Style Champion. WMC World Champion since 2003.
with her gloved fists swinging slowly and rhythmically and with her hood covering most of her eyes. nevertheless, she has a serious expression too. She climbs over the ropes, walks to her corner, and takes off her white robe with blue trim to reveal a more muscular body than Caren’s. blue-and-white striped headband, and orange and yellow ankle bands. 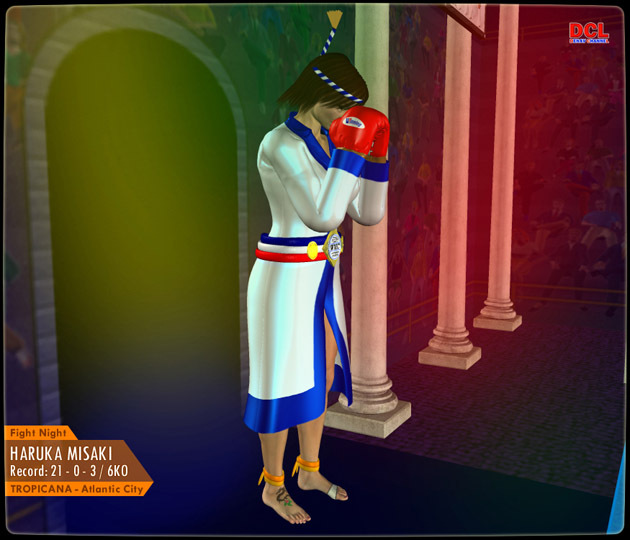 Haruka performs the Ram Muay, the respectful ring ritual. center of the ring to listen to the referee’s rules. neither one retreating from the other’s glare. With both warriors showing such resilience, this will definitely become a great match! The bell clanged, calling for the first round to begin. Round One - Caren is constantly on the defense in this round while her opponent shows the same ferocity as the tiger on her skirt. recovers and strikes out with a right kick to Caren’s head, who barely dodges it. but also receives a strong left kick to the back of her knee. rights to her stomach instead. The round ends, leaving a relieved Caren to return to her corner, where she is encouraged by her trainer to take the offense. Both women glare at each other again. Caren bares her yellow mouthpiece and Haruka returns the expression with her black mouthpiece. hook, Caren dodges and bombs Haruka’s chin with a mighty right jab, baring her teeth through her mouthpiece. to block them with her red gloves. Once she regains her breath, Haruka pushes Caren’s back into a corner while her opponent still has her gloves locked around her head. powerful right hooks to the Swede’s chin and pushes her back into the ropes. With less than fifteen seconds left in this round, Haruka continues the fierce assault against her challenger with more rights and knees. Again, Caren is pleased for the bell to ring for the round to end. The two weary fighters walk back to their corners, glad for rest. Round Three - The fans watch Caren dominating this round. She scorches her opponent with flurries of left and right gloved fists. just as Caren moves forward with a slow left hook. The kick accidentally flies below the belt and strikes Caren in the groin. to regain dominance and sinks a knee into the Swede’s abdomen and receiving a strong left, which jerks her head violently to the left. forward, attacking with a left hook, which misses its target as Caren leans backwards to chop the upper left side of the Japanese fighter. so Caren repeatedly plunges her left knee into the champion’s abdomen until Haruka hooks the left leg with a left arm. Round Four - Caren and Haruka are in their corners, both mostly recovered from the previous rounds thanks to their excellent trainers. A Hooters waitress walks across the ring, holding the card signaling the beginning of the fourth round. raising her knee too late. the champion, who manages to block a few of the blows with her gloves. ...causing Caren to stumble and fall, which is legal. for the fall, she loops a solid, right hook around the red defense of Haruka. to commence. She begins to show marks from the battle, bruised and swollen cheekbones. Haruka’s trainer holds back her hair and holds the water for her to drink from as she readies herself for the final round as well. with her own right knee. retaining her balance. Caren aims a powerful low kick on Haruka’s lower thigh, avoiding her opponent’s futile block. Haruka falls, but there is no eight count because this is a simple fall caused by a low kick. Haruka gets to her feet and is immediately hit by a right kick to her left side, unable to block it with her left knee. Once Caren’s foot touches the mat, Haruka launches her own right kick to the left side of Caren’s face. to push Haruka away and win this crucial round. on the champion’s cheeks, causing the cheekbones to swell instantly. the last bits of their strength. announces her win by Unanimous Decision and the referee raises her left gloved fist into the air. waitress adorns Caren Nilsson’s waist with the WMC Lightweight World Title. 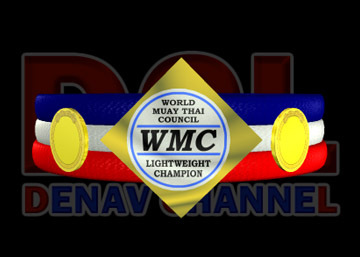 and acknowledging her as the new WMC Lightweight World Champion. All around them, her fans celebrate her victory. Will there be a rematch between Haruka Misaki and Caren Nilsson in an attempt to regain the title?